Sankey plots illustrate the flow of information or material. The API of the package is very simple. You can create a sankey object with make_sankey, and plot it with sankey. make_sankey takes at least one data frame that defines the edges of the plot. This should be a data frame, with the starting points of the edges in the first column, and the end point of the edges in the second column. Both must character vectors. 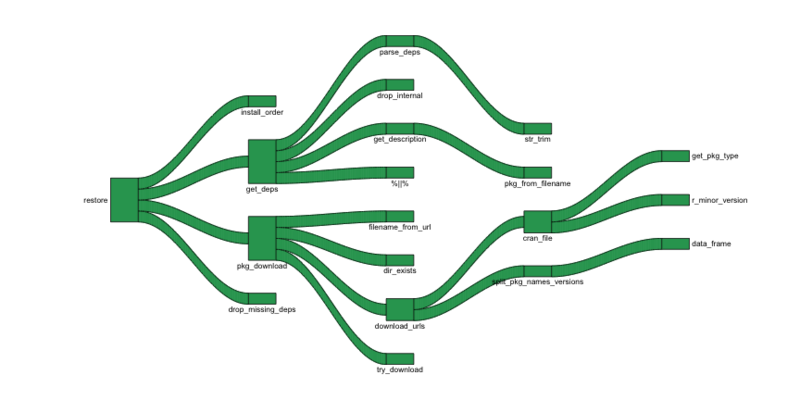 Several properties of the plot can be customized by setting extra columns in the data frame that define the edges, or another data frame, that defines the nodes. colorstyle Whether the to use a solid color (col), or gradient to plot the edges. The color of a gradient edges is between the colors of the nodes. curvestyle Edge style, sin for sinusoid curves, line for straight lines. col Edge color, for edges with solid colors. weight Edge weight. Determines the width of the edges. x Horizontal coordinates of the center of the node. y Vertical coordinates of the center of the node. shape Shape of the node. Possible values: rectangle, point, invisible. lty Lite type, see par. srt How to rotate the label, see par. label Label text. Defaults to node name. adjx Horizontal adjustment of the label. See adj in the par manual. adjy Vertical adjustment of the label. See adj in the par manual. boxw Width of the node boxes. cex Label size multiplication factor. top Vertical coordinate of the top of the node. center Vertical coordinate of the center of the node. bottom Vertical coordinate of the bottom of the node. pos Position of the text label, see par. textx Horizontal position of the text label. texty Vertical position of the text label. Here is the same plot again, with some customization. 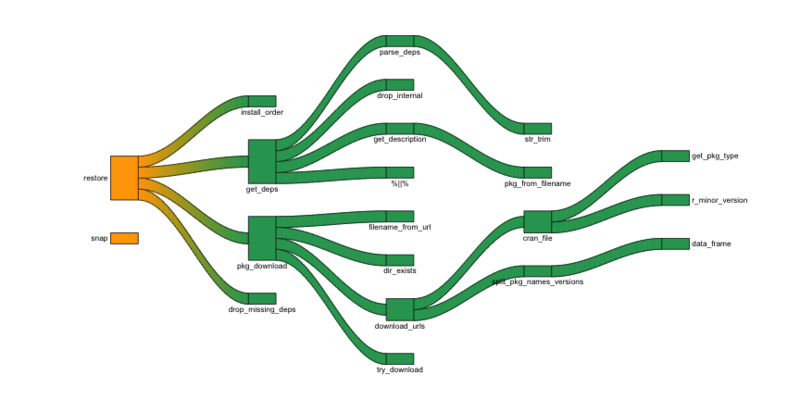 We colored the nodes of the exported functions orange, and also added a color gradient along the edges.